As the stock market reached its lunatic peak near 2,200 in August, the certainty that the Fed is out of dry powder and that the so-called economic recovery is out of runway gave rise to one more desperate pulse of hopium. Namely, that the central banks of the world were about to embark on outright ‘helicopter money’, thereby jolting back to life domestic economies that are sliding into deflation and recession virtually everywhere — from Japan to South Korea, China, Italy, France, England, Brazil, Canada and most places in-between. That latter area especially includes the United States. Despite Wall Street’s hoary tale that the domestic economy has “decoupled” from the rest of the world, the evidence that the so-called recovery is grinding to a halt is overwhelming. And even that was made possible only by an unsustainable build-up in business inventories and the shortchanging of inflation by the Washington statistical mills. Had even a semi-honest GDP deflator been used, the U.S. economy would have posted zero real GDP growth, at best. So the stock market’s 19% melt-up from the February 11 interim low of 1,829 on the S&P 500 was positively surreal. There was not an iota of sustainability to it. In fact, “interim” was exactly the right word for a low that is going a lot lower, and soon. Indeed, the spring-summer rebound was the work of eyes-wide-shut day traders and robo-machines surfing on a thinner and thinner cushion of momentum. What must come next, in fact, is exactly what happens when you stop pedaling your bicycle. Momentum gets exhausted, gravity takes over and the illusion of stability is painfully shattered. But these revelers are going to need something stronger than the hope for “helicopter money” to avoid annihilation when the long-running central bank con job finally collapses. Indeed, that outcome lies directly ahead because helicopter money is a bridge too far. And valuations are literally perched in the nosebleed section of history. As to the latter point, the S&P 500 companies posted Q2 2016 earnings for the latest 12 month period at $86.66 per share. So at the August bubble high the market was being valued at a lunatic 25.1X. Even in a healthy, growing economy that valuation level is on the extreme end of sanity. But actual circumstances are currently more nearly the opposite. Earnings have now been falling for six straight quarters in line with GDP growth that has slumped to what amounts to stall speed. In fact, reported earnings for the S&P 500 peaked at $106 per share in the 12 months ended in September 2014. That means that earnings had fallen 19% since then, even as the stock market moved from 1,950 to nearly 2,200, 13% higher. This is called multiple expansion in the parlance of Wall Street, but it’s hard to find a more bubblicious example. Two years ago the market was trading at just 18.4X, meaning that on the back of sharply falling earnings the PE multiple had risen 36%! Valuation multiples are supposed to go up only when the economic and profits outlook is improving, not when it’s unmistakably deteriorating as at present. But during the spring-summer melt-up these faltering fundamentals were casually ignored on the hopes of a second half growth spurt and, failing that, that the Fed would again pull the market’s chestnuts out of the fire. The growth spurt absolutely has not happened, and the recent sharp drop-off of inbound containers at the West Coast ports means that the U.S. retail sector is not provisioning for any rebound in sales during the coming fall and holiday seasons. And that is why the Wall Street gamblers are so desperately hoping for helicopter money. The fact is, the Fed is out of dry powder via the “extraordinary” measures it has employed since the financial crisis. If the economy visibly drifts into recession, it cannot go to sub-zero interest rates without triggering a Donald Trump-led domestic political conflagration. Nor can it abruptly shift to a huge new round of quantitative easing (QE) without confessing that $3.5 trillion of the same has been a failure. Yet “helicopter money” isn’t some kind of new wrinkle in monetary policy, at all. It’s an old as the hills rationalization for monetization of the public debt — that is, purchase of government bonds with central bank credit conjured from thin air. It’s the ultimate in “something for nothing” economics. That’s because those government bonds originally funded the purchase of real labor hours, contract services or dams and aircraft carriers. As a technical matter, helicopter money is exactly the same thing as QE. Nor does the journalistic confusion that it involves “direct” central bank funding of public debt make a bit of difference. The only thing different technically about “helicopter money” policy is the suggestion by Ben Bernanke and others that the treasury bonds could be issued directly to the Fed. That would just circumvent the dwell time in dealer (or “investor”) inventories. But it would result in exactly the same end state. In that event, of course, Wall Street wouldn’t get the skim. But that’s not the real reason why helicopter money policy is so loathsome. The unstated essence of it is that our monetary politburo would overtly conspire with the White House and Capitol Hill to bury future generations in crushing public debts. There are a few additional meaningless bells and whistles to the theory, but its essential crime against democracy and economic rationality should be made very explicit. It would amount to a central bank power grab like no other because it moves our unelected central bankers into the very heart of the fiscal process. Needless to say, the framers delegated the powers of the purse — spending, taxing and borrowing — to the elected branch of government. They did so because the decision to spend, tax and borrow is the very essence of state power. There is no possibility of democracy — for better or worse — if these fundamental powers are removed from popular control. Yet that’s exactly what helicopter money policy would do. At one level, of course, it is to be expected that the people’s elected representatives would relish this “expert” cover for ever bigger deficits as an opportunity to dramatically increase pork barrel spending. Yet the deliberate, wanton addition of trillions to the public debt just so that the Fed can print an equivalent amount of new credit out of thin air might be too much even for them. Helicopter money turns the inherently dangerous idea of fiscal borrowing in a democracy into an outright monetary fraud. And that prospect is sure to kindle lingering fears of the public debt even among the politicians. For example, even New Dealer FDR worried about the rising public debt. And “Fair Dealer” Harry Truman positively loathed it. So when push comes to shove, even today’s beltway politicians are likely to find the underlying theory of helicopter money to be beyond the pale. It comes as no shock that “Helicopter’ Ben Bernanke is a big fan. He’s a demented paint-by-the-numbers Keynesian with a worse grasp on the real world than the typical astrologer. That’s why the crucial element in his helicopter money scheme, as he explained in a Washington Post op-ed, will leave them scratching their heads even in the always credulous Capitol Hill hearing rooms. According to Bernanke, the secret sauce of helicopter money is an explicit and loud announcement by the Fed that the incremental public debt will be permanent. It will never, ever be repaid — not even in the distant future. But the reason for it is downright lunatic. 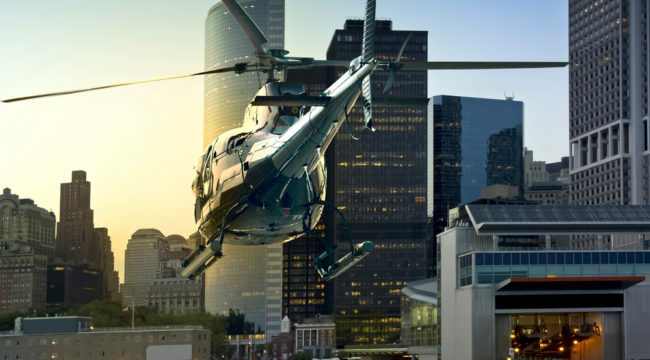 Unless current taxpayers are assured that future taxes will not rise due to Washington’s helicopter money handouts and tax breaks, says the Bernank, they won’t spend the government gifts they find strewn along the helicopter flight path. That’s right. When a road building boom from helicopter money appropriations results in surging demand at the sand and gravel pits, the small-time businessman involved won’t buy any additional trucks or hire any additional drivers until Washington assures him that he won’t pay higher taxes 25 years later! Only in the Eccles Building puzzle palace does such drivel not elicit uncontainable laughter. So at the end of the day, “helicopter money” is just a desperate scam emanating from the world’s tiny fraternity of central bankers who have walked the financial system to the brink, and are now trying to con the casino into believing they have one more magic rabbit to pull out of the hat. They don’t. That’s because helicopter money will not pass the laugh test even in the Imperial City, and, more importantly, because it takes two branches of the state to tango in the process of implementation. Unlike ZIRP and QE, helicopter money requires the people’s elected representatives to play along. That is, the Congress and White House must generate large incremental expansions of the fiscal deficit so that the central bank can buy it directly from the U.S. Treasury. Then it would credit the government’s Fed accounts with funds conjured from thin air. But this assumes there is still a functioning government in Washington and that most politicians have been 100% cured of their instinctual fears of the public debt. What is going to cause helicopter money to be a giant dud — at least in the U.S. — is that neither of these conditions exist. Regardless of whether the November winner is Hillary or the Donald, there is one thing certain. There will be no functioning government come 2017. Washington will be the site of a deafening and paralyzing political brawl like none in modern U.S. history, or ever. The reality of rapidly swelling deficits even before enactment of a massive helicopter money fiscal stimulus program will scare the wits out of conservative politicians. And much of the electorate, too. The prospect that the resulting huge issuance of treasury bonds will be purchased directly by the Fed will only compound the fright. Even if Wall Street talks it up, there will be massive, heated, extended and paralyzing debate in Congress and the White House about it for months on end. There is little chance that anything which even remotely resembles the Bernanke version of helicopter money could be enacted into law and become effective before 2018. Will the boys and girls still in the casino after the current election gong show is over patiently wait for their next fix from a beltway governance process that is in stalemate? I think the odds are between slim and none. If Trump is elected the fiscal process will lapse into confrontation and paralysis for an indefinite spell. And it Hillary is elected, the Republican House will become a killing field for almost anything she proposes. That certainly includes the Keynesian doctrine of outright and massive debt monetization.